Automation, artificial intelligence, and other technological advances associated with the Fourth Industrial Revolution are changing the nature of work globally. A new report, The Future of Work: Regional Perspectives , assesses what rapid technological progress could mean for developing and emerging economies. In the chapter focusing on Africa, the report finds that new technologies could enable much-needed productivity growth and stimulate new types of economic activities; for example, retail and financial services given the high penetration of mobile devices in the region. However, a technologically driven rise in productivity could also mean that fewer people are needed to perform the same tasks, which could have dire implications for employment, especially considering the job creation challenges the region already faces. Most African economies—already marked by high unemployment, underemployment, vulnerable employment, and working poverty—are characterized by large agricultural and informal sectors that generally have low wages and low productivity. Given that Africa’s youth population, already facing high unemployment, is expected to double to over 830 million by 2050, there is a sense of urgency for policies that will enable youth to find decent jobs. Various development strategies at the regional and national levels have emphasized the need for structural transformation to increase productivity while also absorbing labor. Common themes in these agendas include promoting high-productivity agricultural sectors and agro-processing, with jobs along agricultural value chains (in manufacturing, logistics, and retail); modernizing the services sector using information and communication technologies (ICTs); boosting local content and local participation in extractives; developing competitive, export-oriented manufacturing sectors; and investing in the infrastructure necessary for businesses to start and grow. The report discusses how new technologies could support—or possibly hinder—the region’s structural transformation agenda. 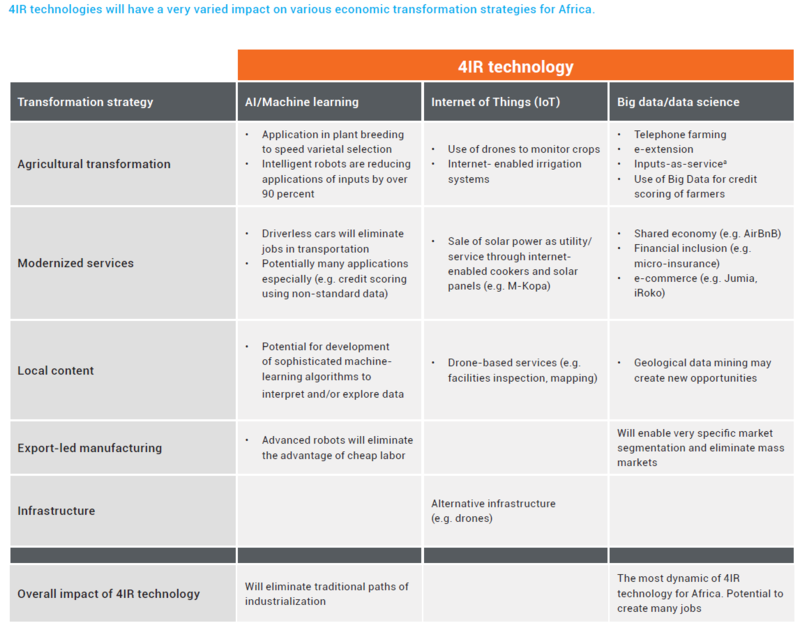 Table 1 rates the net impact of new technologies on Africa’s economic transformation and finds that the effects could be moderately to highly positive for modernizing the agricultural and services sectors, as well as promoting local content and local participation in extractives sectors. Source: The Future of Work: Regional Perspectives, 2018. In agriculture—ICTs, autonomous vehicles, and the use of big data could drive precision agriculture and open up new markets for farmers. In services—beyond mobile banking and other financial services, mobile and internet-based businesses are already rapidly emerging in retail and transport. In extractives—3-D printing could make it possible for local industries to construct specialized equipment and parts. On the other hand, the report finds the impact on infrastructure to be neutral and the impact on export-led manufacturing to be detrimental. The report argues that robotics will erode Africa’s cheap labor advantage in manufacturing—as labor costs in Asia continue to rise and developed countries opt to automate and reshore manufacturing activities—dashing prospects that the region could become the next big international manufacturing hub. 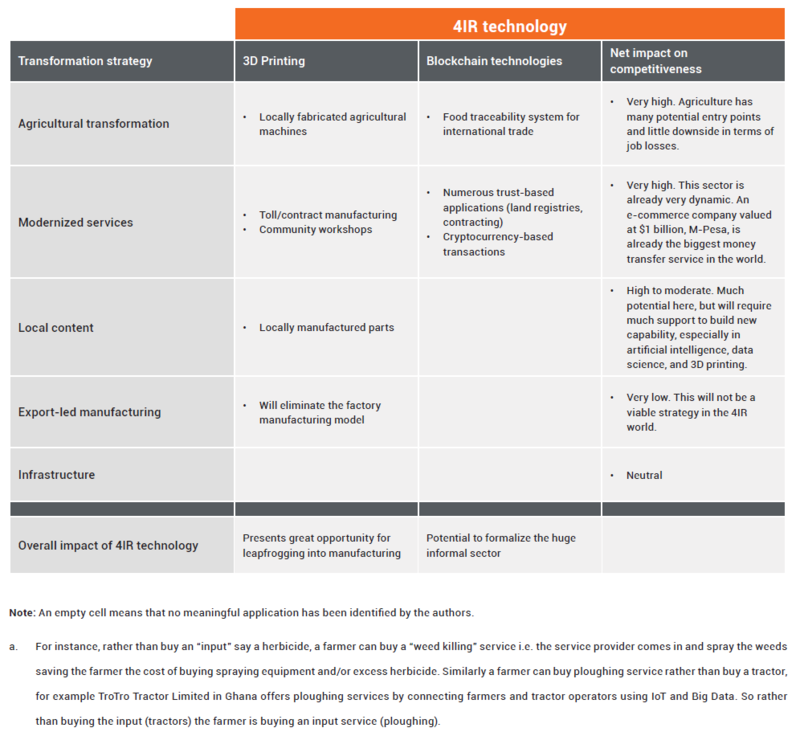 However, certain manufacturing sub-sectors will automate more slowly than others, giving the region some time to develop manufacturing capabilities for local and regional markets and adapt to this disruption. Still, the report concludes that, for Africa, the Fourth Industrial Revolution could usher in increased productivity in the modern agricultural and services sectors, with positive outcomes for development. However, to realize the potential productivity gains from new technologies, the continent will need to better prepare workers to participate in these modern sectors, ensuring they have the skills and science, technology, engineering, or mathematics (STEM) education necessary to take advantage of these opportunities. 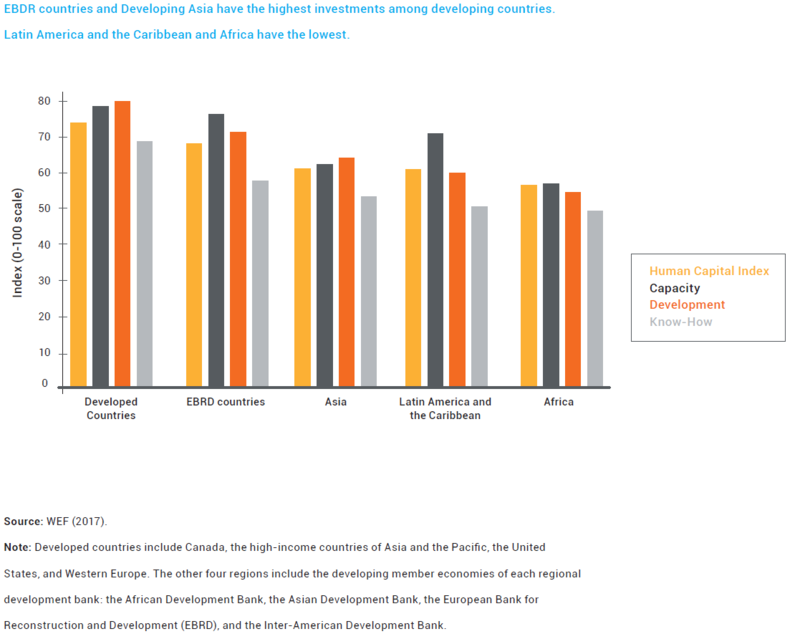 Figure 1 below illustrates that the skills base of Africa’s workforce is lower than that of other regions, as indicated by the Human Capital Capacity Index score, which reflects the percentage of the region’s workforce that has attained tertiary, secondary, and primary education, as well as the percentage that has literacy and numeracy skills. Based on this estimate, African governments must make steep investments in educating and training workers to prepare them for the future of work in the region. By the African Development Bank, Asian Development Bank, European Bank for Reconstruction and Development, and Inter-American Development Bank.